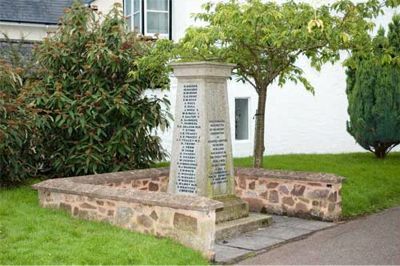 The Willand War Memorial commemorates all the men who served in the Great War 1914 - 1919 with the names of those who died being marked with a cross as well as the men who died serving in the 1939 - 1945 War. THIS MEMORIAL WAS ERECTED BY VOLUNTARY SUBSCRIPTION IN HEARTFELT GRATITUDE TO THE MEN OF WILLAND WHO SERVED IN THE GREAT WAR 1914 - 1919. The remaining faces list the men who served in the First World War as well as those who died. On this page, those who died are listed first - the names of those who served follow at the bottom of this page. Private James Bristow (sometimes "Bristowe") of the 9th Battalion, the Devonshire Regiment. Son of the late James and Emma Bristow. Born in the September Quarter of 1892 in Willand. Died 4 October 1917 aged 25. Private Arthur John Chick of the 12th Battalion, the Lancashire Fusiliers. Son of Albert and Kezia Chick of Willand. Born in the March Quarter of 1891 in Willand. Died 4 October 1916 aged 26. Able Seaman George Victor Eveleigh of the Royal Navy, HMS Bittern. Son of Arthur and Martha Eveleigh. Born in the June Quarter of 1897 in Uffculme. Died 4 April 1918 aged 20. Private William James Fisher of the 8th Battalion, the Devonshire Regiment. Son of William and Susan Fisher of Millcotts, Shobrooke, Crediton and husband of Edith Rose Glover (formerly Fisher). Born in the September Quarter of 1892 in Upton Hellions. Died 26 October 1917 aged 25. Private Edmund Goff of the 13th Coy, the Australian Machine Gun Corps. Son of John and Hannah Goff of Willand. Born in the September Quarter of 1890 in Kentisbeare. Died 18 July 1917 aged 27. Corporal Walter Gollop of the Royal Marine Light infantry, HMS Monmouth. Son of the late George and Sarah Gollop and husband of Alice Gollop of 110, Westexe South, Tiverton. Born in the December Quarter of 1884 in Willand. Died 1 November 1914 aged 30. Private Alfred Thomas Govier of the 9th Battalion, the Devonshire Regiment. Son of Fredrick and Sarah Govier, of Willand and husband of Mary Veale (formerly Govier), of Chettiscombe, Tiverton, Devon. Born in the September Quarter of 1892. Died 13 December 1915 aged 23. Private Albert Grabham of the 2nd Battalion, the Devonshire Regiment. Son of Bessie Moore, of 31, Rockwell Green, Wellington, Somerset. Born in the December Quarter of 1917 in Uffculme. Died 25 February 1917 aged 19. Private Rupert Wood Rabjohns of the 1st Battalion, the Devonshire Regiment. Son of William and Jane Rabjohns and husband of Ellen Rabjohns. Born in the September Quarter of 1883 in Bath. Died 23 April 1917 aged 34. Private James Rugg of "C" Coy, 8th Battalion, the Devonshire Regiment. Son of John and Elizabeth Rugg, of Muxbeare Cottage, Willand and brother of William (see below). Born in the December Quarter of 1895 in Willand. Died 25 September 1915 aged 20. Gunner William Henry Rugg of the Royal Marine Artillery. Son of John and Elizabeth Rugg, of Muxbeare Cottage, Willand and brother of James (see above). Born in the December Quarter of 1879 in Willand. Died 9 November 1916 aged 36. Buried in the churchyard of St. Mary,Willand. Private Ernest Salter of the 6th Battalion, The Buffs (the East Kent Regiment). Son of Charles and Jane Salter, of Silver St., Willand and husband of Emily M. Salter, of "Wood House", Foxhall, Ipswich, Suffolk. Born in the March Quarter of 1887 in Halberton. Died 26 March 1918 aged 31. Lieutenant Geoffrey Eugene Tracey of the 9th Battalion, the Devonshire Regiment. Son of Emily Alice Tracey, of The Gables, Willand and the late H. Eugene Tracey, M.B. Born in the December Quarter of 1915 aged 19. Private Ivor Frank Ball of the 12th (Airborne) Battalion, the Devonshire Regiment. Born in the June Quarter of 1914 in Willand. Died 24 March 1943 aged 29. Private Frederick Albert Chamberlain of the 4th battalion, the Dorsetshire Regiment. Son of Joseph and Emily Chamberlain and husband of Betty Doreen Chamberlain, of Willand. Born in the December Quarter of 1914 in Exeter. Died 15 July 1944 aged 30. Buried in the churchyard of St Mary's,Willand but not listed on the churchyard Memorial. Leading Aircraftman (Pilot under training) Alfred Musgrave Potter Bickford of the RAF Volunteer Reserve. Died 23 December 1940.